December 2015 – ADVOCATES FOR FINE ART ENAMELING INC.
Anne Dinan is a regionally recognized fine art enamelist who innovates by combining vitreous enamel with photographic images. Some of her images are included in Christopher James’ “3rd Edition: The Book of Alternative Photographic Processes,” 2015. Her process is kiln firing digital waterslide transfers to vitreous enamel on copper. A native of Topsfield, MA, she attended the Museum School of the Museum of Fine Arts, Boston, MA. Currently she lives in Exeter, NH, where she makes art and jewelry, and teaches enameling and creative techniques. 33 x 13 x 2 in. 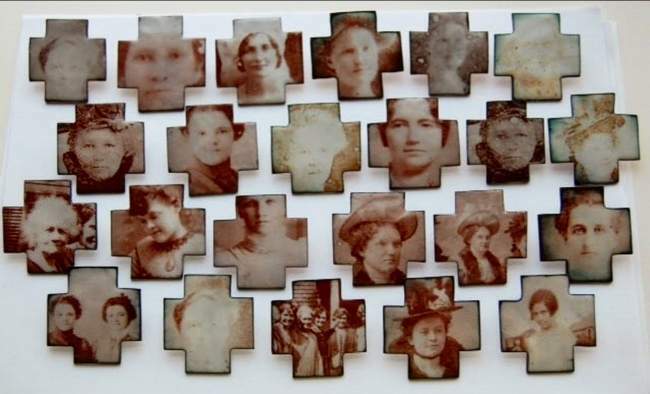 Dinan’s “Unknown Relatives” is an assemblage of 20 photographs selected from a treasure of old portrait photographs found at a family farm in Michigan. The images are mounted on found wood from an old wheelbarrow. This online illustration sadly fails to capture the “dreamy” quality or the sentimental and poignant mood of the piece, which is captivating and lends an inclusive universality to the faces. “Unknown Relatives” is a wall work prize winner in Alchemy3, the touring show of the Enamelist Society’s 15th biennial international juried exhibition. It will be on display in concord, New Hampshire when Alchemy3 opens at the gallery of the League of New Hampshire Craftsmen on January 15, 2016. Images from Dinan’s collection. Each face evokes some affecting memory for someone. Dinan continues to experiment with the challenge of melding photographic transfer with the special characteristics of vitreous enamel as a medium. The mood shifts as Dinan introduces organic and graphic forms to her enamel and wood compositions. To see more of Anne Dinan’s works of art, in enamel and other media, please visit her website.